New Delhi: After GTB hospital, 5 more hospitals that come under the Delhi Government have now implemented the ‘Happiness Therapy’, an initiative envisaging the physical, cognitive, emotional and social integration of patients and hospital staff. 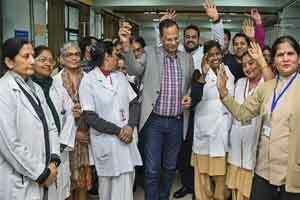 The project was first rolled out in GTB hospital by Health Minister Satyendra Jain on January 17, 2019, in GTB hospital. ‘Happiness Therapy’ encompasses the use of experiential techniques such as dance, songs, yoga, meditation and laughter to enable holistic and speedy recovery. Following its launch, the Delhi Government directed every hospital to appoint a nodal officer to facilitate the implementation of ‘Happiness Therapy’. “While treatment takes its own course, the happiness brings about synergy which complements the effects of the treatment. Ultimately, it is a win-win for patients and doctors alike,” he said. After participating in the activity, 32-year-old Safina said: “I did not even know how to effectively wash hands to prevent diseases until I saw the staff performing the play.